Welcome to our January 2011 design newsletter! Happy New Year everybody! Today I will keep my promise and review the appearance of one local San Diego business from a designer's point of view. A building in this article is familiar to most of you and that is why I'd love to hear your feedback on the ideas presented here. Also, down below you will find a few links to some useful information for your business space redesign. If you are in a process of branding, take a look if this new e-book could be useful to you as well: "Branding By Interior." Please enjoy! And don’t forget to post your reply to this newsletter on our Blog. In our Green News corner, I will share a glimpse of an amazingly small apartment which can transform into 24 rooms with different functions. This fascinating design came from an architect of Hong Kong who had to utilize every inch of his livable space downtown of a big city. Just a reminder, if you do not wish to receive this newsletter for any reason, please unsubscribe from my mailing list HERE. "DON'T TELL HOTEL LA QUINTA!" The name of this article "Don't tell Hotel La Quinta" appeared when I told one of my friends that I want to review La Quinta's image. She smiled at me, said that exact phrase, and added: "La Quinta just completely revamped their image and repainted their buildings here in San Diego!" I am not a hotel reviewer, nor am I a hotel owner (just yet), and I am not even a professional writer. I am a designer, so I look at everything around me through that prism of what works and what doesn't in terms of design. I also like to point out why it happens in both situations. So here is my take on the local Hotels called La Quinta. Read more on How to Brand Your Business By Interior. Hotel La Quinta in San Diego, CA is one of those buildings that cannot go unnoticed simply because of its color scheme on top of not such a bad-looking (cross of craftsman and Spanish styles) building. There are two hotels in different locations which I know very well because I drive by them every time I go anywhere in the city. The striking yellow colors that appear on both buildings at the same time are really bright and make both places look sweltering and uninviting. Hotel La Quinta's logo on the hotels' website. I will be honest, I would love to donate my time and provide this company a new color scheme, but the reality is that the color and materials selection is all dictated from the corporate headquarters in Dallas, Texas. So maybe YOU can learn from this case study not repeat similar mistakes in updating your building or business. Here is what I see from looking at La Quinta hotel's buildings. The colors of the buildings are derived from the company's logo, which in theory would be a perfect solution in any branding process. Well, the problem is that those colors happened to be Green and Yellow! And in combination with the red tiles of the Spanish roof, it just doesn't work. Newly repainted Hotel La Quinta in Scrips Poway, CA looks very uninviting. The design of the hotels La Quinta was not customized to each building location by the corporate designers. The color scheme selection was probably done by people in Texas who do not know all the different architecture styles these colors would be applied to around the country. Local hotel owners followed the corporate design rules without looking at the style of their buildings and without consulting a local design professional. So disregarding everything that was done to the buildings, what can be done NOW to make a better impression and to help these hotels look their best? Doing a little research I've found some other La Quintas around the country. This La Quinta Inn and Suites was tastefully designed in similar "logo" colors but with neutral shades of gray and white to give your eyes a desired rest and balance. It is not a problem that the style of this building is more contemporary and here is why below. As a designer I would like to start with the basics. Let's go back and look at the color wheel. 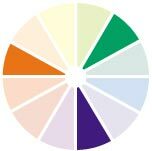 A color wheel is a chart with 12 basic colors derived from rainbow from which we (designers) use to select our pallet of colors. On a color wheel, there are 3 primary colors which are unique and cannot be made by mixing other colors. These 3 colors are shown below: yellow, blue and red. There are also additional colors which are created by mixing the first 3 colors above. These colors are green, purple and orange. Green can be created by mixing yellow and blue, purple is created by mixing blue and red, and orange colors are derived from yellow and red. Now, we have to remember that these colors are prime and very bright. The rest of the colors are the transitions between the prime colors, which are used by designers to complement main selected colors. There are also different shades of the mentioned colors, from light to dark and colors of different intensity. I am not going to go into every aspect of a color theory here but I hope you can follow what comes next. Here are the existing colors of Hotel La Quinta which are all prime colors: Yellow and Red with a Green logo you can't see on this picture. What's happening in a case of La Quinta paint is the 2 prime colors collide into each other without any relief for our eyes. All shades of Yellow with Red roof tile and a Green Signage bring the brightest colors on the color wheel together where they simply fight each other on such a large size building. Here are examples of similar so called "color fights" if we used other primary colors for the same hotel (see images below.) For the demonstration purpose I've combined Blue and Red and then Green and Red - all prime colors. 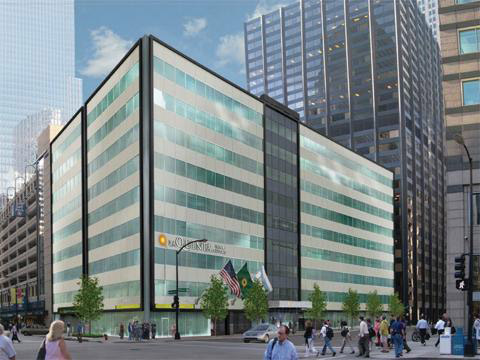 As you can see for yourself, creating all prime colors combinations will always look bad in such building application. In fact, we can play all day with prime colors trying to combine them on this buildings and it will not look good! So, what is the answer you ask? You probably guessed it that to harmonize these colors you have to go a shade next to these prime colors as well as choose different intensity of your selected colors. Combining blue and red or green and red colors do not work here as well. 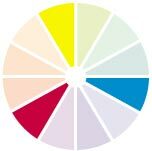 These are our prime colors on a color wheel, which should be complemented by colors of different intensity and shade to give a needed visual relief to our eyes. 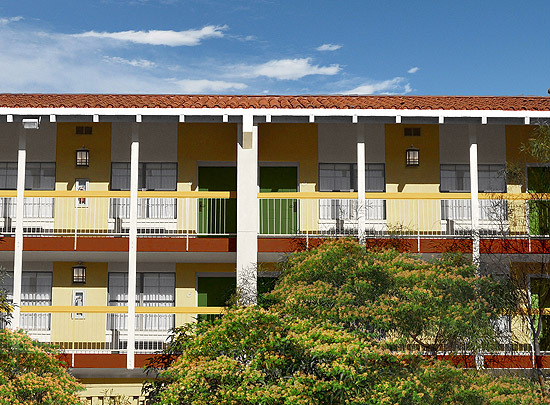 But selecting better colors is not the only problem solver in a case of La Quinta building design. So, what else can be done to make this building to stand out? Highlighting details is very important in any building design. A German-born architect Ludwig Mies van der Rohe noted this long time ago, leaving us his famous saying: "God is in the detail." In case of La Quinta hotel, the balconies painted in almost same shade of yellow make everything on the building flat and uninteresting, almost like a prison or a badly-designed hospital. There is nothing to rest your eye on or to create visual interest. Here is something to remember for any property owner: by accenting some architectural elements, and creating contrast by applying various textures, a building will get an immediate perceived value increase! This design law applies to any type or style of a building, contemporary or traditional. On the La Quinta hotel, I would definitely highlight the balconies' railing and the repeated elements, such as columns, light fixtures, doors and windows. I would accent the doors with complementary colors and outline the window frames to bring out some character. And why not try to follow all the different styles of the La Quintas buildings, and work with them instead of fighting them? 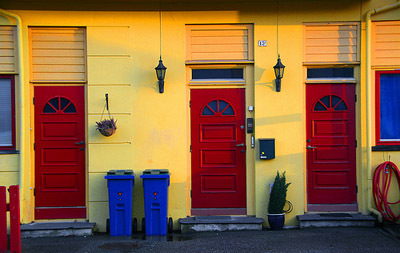 This smaller building also has a bright yellow exterior color, but what an amazing transformation from brightly painted red doors! Even though the two colors are also prime and bright, and because the doors are just small accents and the building is in a much smaller scale, the building looks quite good. All of the additional details, such as window frames and lighting fixtures, help complete the design. I wanted to point your attention to different textures as well. In case of the La Quinta Hotel, there are great opportunities to differentiate such textures as stucco, roof tiles, wood, glass, stone, and even greenery surrounding the building. Landscape can be perceived as an additional layer of texture, making a building float on a soft, cloud-like greenery. Or it could complement your architecture with sharper shapes of more defined local plants. When we work with any existing local architecture, we have to be respectful to the buildings and to the local setting while trying to promote a brand of a company. Combining those two could only be done by a professionally trained designer. If in doubt, please look around for professionals; it doesn't cost that much to get a color consultation or to receive some simple branding comments from a local designer. 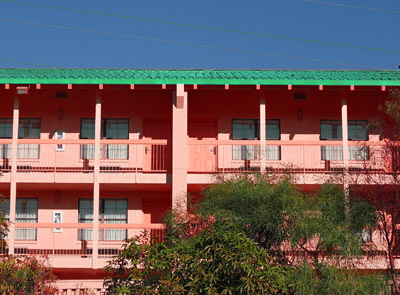 I've put this simple color scheme together in 15 minutes to give you some ideas on how to make a few changes to the San Diego La Quinta building with ONLY paint. I did use the hotel's branding colors (yellow and green), but I used these colors only as accents - not as main colors. The white color on the walls gives rest to our eyes, and in combination with yellow, creates a much-needed contrast. Green doors add the logo color to follow the branding and to add interest to overall architecture. I've also added more defined light fixtures to complement the architecture. The new landscape has tones of yellow to further create an inviting atmosphere. See other design projects by Mindful Design Consulting HERE. Get a FREE Video of YOUR Business Space from Us! Learn About Branding By Interior From a New Book! In Hong Kong, because of the lack of space and overpopulation, apartments are small and very expensive. Gary Chang, an architect, decided to design a 344 sq. ft. apartment able to change into 24 different designs, all by just sliding panels and walls. He calls this creation the "Domestic Transformer." Watch a video of the amazing transformation HERE. Lower Your Electric Bill Up To $300 a Year!